On the occasion we've had to have surgery, it's likely that we were under the influence of pain killers. 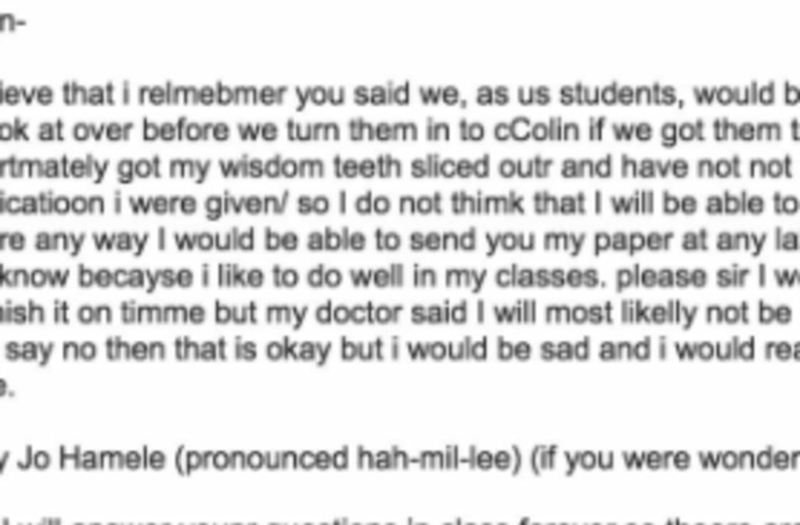 Unfortunately, one student happened to be using her email after her wisdom teeth surgery ... and the results are hilarious. 19-year-old college student Abby Jo Hamele was so out of it that she emailed her teaching assistant about a deadline that did not exist. Post-MOMA PS1 lunch. #ps1 #passiveaggressivenotes #doeswatercount? I believe that i relmebmer you said we, as us students, would be able to send you our papers for classss for you to look at over before we turn them in to cColin if we got them to you by the 22nd of Novermber. I unfortmately got my wisdom teeth sliced outr and have not not been reacting very well to the surgeryy nor the medicatioon i were given/ so I do not thimk that I will be able to habe my paper finisherd by Tuesday at all. Is tehere any way I would be able to send you my paper at any later date??? I wnt to do very good on this paper you know becayse i like to do well in my classes. please sir I workled very hard and thouught that I would be abel to finish it on timme but my doctor said I will most likelly not be normal again until at least Thanksginvg turkey. If you say no then that is okay but i would be sad and i would reallyyyy lik e it if you said yes. Thank you Kevin, my dude. The letter quickly went viral, getting thousands of likes and retweets. "I hope your spelling is better in your paper," he joked.